Please note: The ThunkIt application is not available as planned for this edition of the book. Please note that the website www[.]thunkit[. ]net no longer relates to this book. The first five chapters introduce the essentials of Alice, building a foundation from which students can move easily to Java™. 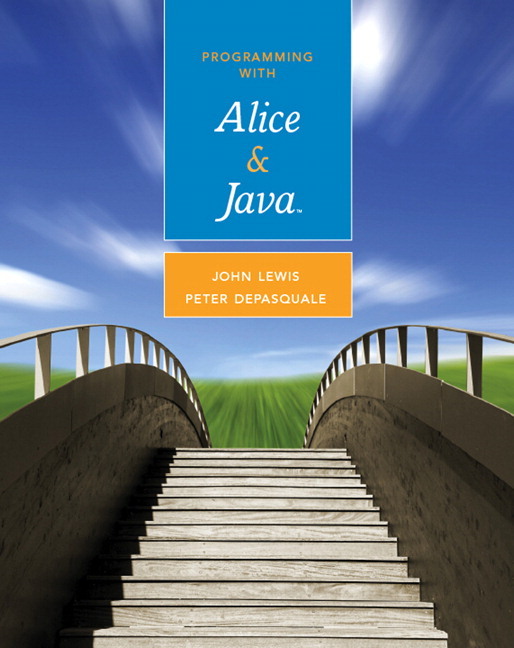 The remaining chapters extend the Alice principles into Java for an easier transition into object-oriented programming. A full-color design throughout helps students grasp concepts visually, especially in the Alice chapters where screenshots are displayed with nearly every paragraph. Try This features take examples from the book and demonstrate how students can apply what they’ve learned through hands-on activities. A Student Resource CD-ROM, packaged with every new text, includes source code, Alice, Alice worlds, JDK 6.0, and jGrasp™ IDE. John Lewis is the co-author of the Java™ textbooks used for AP computer science classes: Java Software Solutions , Java Software Structures , and Java Foundations , a comprehensive resource for instructors who want a two-semester introduction to programming textbook that includes data structures topics. He currently teaches courses at both Virginia Tech and Radford University. He received his PhD degree from Virginia Tech. Peter DePasquale is an assistant professor of computer science at the College of New Jersey (TCNJ). He is the author of Addison-Wesley’s Java Backpack Reference Guide and Addison-Wesley’s C++ Backpack Reference Guide. He is the co-author of Java Foundations , a comprehensive resource for instructors who want a two-semester introduction to programming textbook that includes data structures topics.